1. 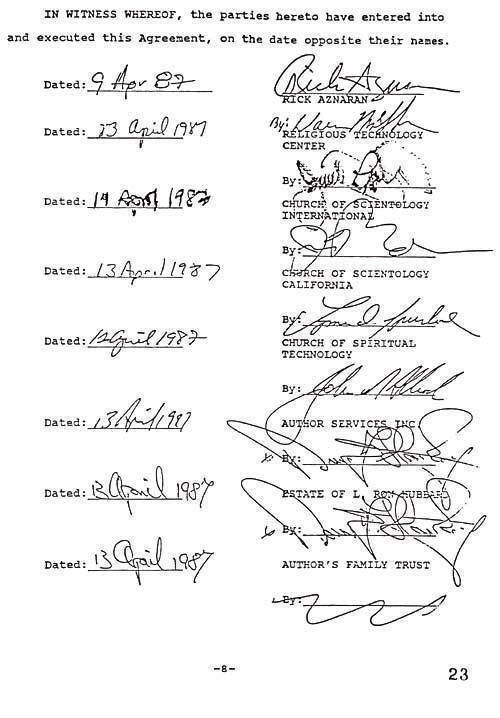 This MUTUAL RELEASE AGREEMENT is made and entered into by and between RICK AZNARAN and the Religious Technology Center; Church of Scientology International; Church of Scientology of California; Church of Spiritual Technology; all other Scientology organizations or entities as well as the officers, agents, representatives, employees, volunteers, trustees, directors, successors, assigns, and legal counsel of each of the forgoing organizations or entities; Pat Broeker and Anne Broeker (hereinafter collectively referred to as the "CHURCH"); and Author Services Incorporated, it's officers, agents, representatives, employees, volunteers, trustees, directors, successors, assigns and legal counsel; the Estate of L. Ron Hubbard, it's executor, beneficiaries, legal counsel and employees; Author's Family Trust, it's trustee, employees, beneficiaries, and legal counsel (hereinafter collectively referred to as the "ESTATE/ASI"). 2. The CHURCH agrees to indemnify RICK AZNARAN against any damages stemming from lawsuits which exist now or are brought against him in the future arising out of his association with the Church of Scientology or any posts he has held in the Church. It is understood that as a part of this agreement the CHURCH will provide free legal counsel to RICK AZNARAN providing he cooperates fully with the CHURCH and CHURCH attorneys and he contacts the CHURCH immediately when he becomes aware of any potential or real legal threat to himself and/or the CHURCH. 3. For and in consideration of the above mutual covenants, conditions and release contained herein, RICK AZNARAN does hereby release, acquit and forever discharge for himself, his heirs, successors, executors, administrators and assigns, the CHURCH and the ESTATE/ASI from any and all claims, demands, damages, actions and causes of action of every kind and nature, known or unknown, from the beginning of time to and including the date hereof. 4. For and in consideration of the mutual covenants, conditions and release contained herein, the HURCH and the ESTATE/ASI do hereby release, acquit and forever discharge for it, its successors and assigns, RICK AZNARAN, his agents, representatives, heirs, successors, assigns, legal counsel and estate and each of them, of and from any and all claims, causes of action, demands, damages and actions of every kind and nature, known or unknown, for or because of any act or omission allegedly done by RICK AZNARAN from the beginning of time to and including the date hereof. 5. It is understood that this mutual release is not an admission of liability on the part of any party to this Agreement. In executing this Release Agreement, RICK AZNARAN acknowledges that he has released the organizations, individuals and entities listed in Paragraph 1. A. That liability for any claims is expressly denied by each party herein released, and this Agreement shall never be treated as an admission of liability or responsibility at any time for any purpose. B. RICK AZNARAN has been fully advised and understands that any alleged injuries or alleged money claims sustained by him are of such character that the full extent and type of injuries or money claims may not be known at the date hereof, and it is further understood that said alleged injuries, whether known or unknown at the date hereof, might possibly become progressively worse and that as a result, damages may be sustained by RICK AZNARAN; nevertheless, RICK AZNARAN desires by this document to forever and fully release the CHURCH and the ESTATE/ASI. RICK AZNARAN understands that by the execution of this release no claims arising out of his experience with, or actions by, the CHURCH and the ESTATE/ASI, from the beginning of time to and including the date hereof, which may now exist or which may exist in the future may ever be asserted by him or on his behalf, against the CHURCH and the ESTATE/ASI. Scientology, L. Ron Hubbard, or any of the organizations, individuals and entities listed in Paragraph 1 above. RICK AZNARAN expressly understands that the non-disclosure provisions of this subparagraph shall apply, but not be limited to, the contents or substance of any documents he may have possessed while in the Church including but not limited to any tapes, films, photographs, or variations thereof which concern or relate to the religion of Scientology, L. Ron Hubbard, or any of the organizations, individuals, or entities listed in Paragraph 1 above. RICK AZNARAN agrees that if the terms of this paragraph are breached by him, that the aggrieved party listed hereinabove would be entitled to liquidated damages in the amount of $10,000 for each such breach. The reasonableness of the amount of such damages are hereto acknowledged by RICK AZNARAN. D. RICK AZNARAN agrees to return to the CHURCH at the time of the consummation of this Agreement, all materials in his possession, custody or control of any nature - except for any materials he personally possesses that are generally publically available and sold by the Church or their authorized agents - any documents, papers, memorandums, tapes, films, photographs, or any variations thereof which concern or relate to the religion of Scientology or any of the persons or entities listed in Paragraph 1 above. Paragraph 1 above in any proceeding against any of the organizations, individuals, or entities listed in Paragraph 1 above. RICK AZNARAN also agrees that he will not cooperate in any manner with any organizations aligned against Scientology and any of the organizations, individuals, or entities listed in Paragraph 1 above. F. RICK AZNARAN agrees not to testify or otherwise participate in any other judicial, administrative or legislative proceeding adverse to Scientology or any of the organizations, individuals or entities listed in Paragraph 1 above unless compelled to do so by lawful subpoena or other lawful process. Unless required to do so by such subpoena, RICK AZNARAN agrees not to discuss his experiences or personal or indirectly acquired knowledge or information concerning the organizations, individuals, or entities listed in Paragraph 1, with anyone other than members of his immediate family. RICK AZNARAN shall not make himself amenable to service of any such subpoena in a manner which invalidates the intent of this agreement. As provided hereinafter in Paragraph 16, the contents of this Agreement may not be disclosed. G. RICK AZNARAN hereby acknowledges and affirms that he is not under the influence of any drug, narcotic, alcohol or other mind-influencing substance, condition or ailment such that his ability to fully understand the meaning of this Agreement and the significance thereof is adversely affected. amended only by a written instrument executed by the undersigned. The parties hereto have carefully read and understand the contents of this Release Agreement and sign the same of their own free will, and it is the intention of the parties to be legally bound hereby. No other prior or contemporaneous agreements, oral or written, respecting such matters, which are not specifically incorporated herein shall be deemed to in any way exist or bind any of the parties hereto. 8. RICK AZNARAN agrees that he will not assist or advise anyone, including partnerships, associations or corporations, contemplating any claim or engaged in litigation or involved in or contemplating any activity adverse to the interests of any entity or class of persons listed above in Paragraph 1 of this Agreement. 9. The parties to this Agreement acknowledge that all parties enter into this Agreement freely, voluntarily, knowingly and willingly, without any threats, intimidation or pressure of any kind whatsoever and voluntarily execute this Agreement of their own free will. 10. In the event any provision hereof is unenforceable, such provision shall not affect the enforceability of any other provision hereof. 11. Each party warrants that it has had an opportunity to seek independent legal advice with respect to the advisability of making the settlement provided for herein and in executing this Agreement. Notwithstanding, RICK AZNARAN warrants that he fully understand the full nature and legal consequences of this agreement. 12. The parties to this Agreement acknowledge that all parties have conducted sufficient deliberation and investigation, either personally or through other sources of their own choosing, and have had the opportunity to seek advice of counsel regarding the terms and conditions set forth herein, so that they may intelligently exercise their own judgment in deciding whether or not to execute this Agreement. 13. The parties hereto acknowledge that they have not made any statement, representation or promise to the other party regarding any fact material to this Agreement except as expressly set forth herein. Furthermore, except as expressly stated in this Agreement, the parties in executing this Agreement do not rely upon any statement, representation or promise by the other party or of any officer, agent, employee, representative or attorney for the other party. 14. The parties to this Agreement agree that all parties have carefully read this Agreement and understand the contents thereof and that each reference in this Agreement to any party includes successors, assigns, principals, agents and employees thereof. 15. Each party warrants that the persons signing this Agreement have the full right and authority to enter into this Agreement on behalf of the parties for whom they are signing. 16. The parties hereto each agree not to disclose the contents of this executed Agreement. IN WITNESS WHEREOF, the parties hereto have entered into and executed this Agreement, on the date opposite their names.